Close your eyes for a moment. Place yourself in a traditional learning situation. What’s happening? The teacher is at the front of the room, right? Who is doing the talking? The teacher, right? Who is standing, moving around the room? Who is engaged with the ideas and the information? Whose voice do you hear most of the time? Who’s excited? The teacher, the teacher, and the teacher. 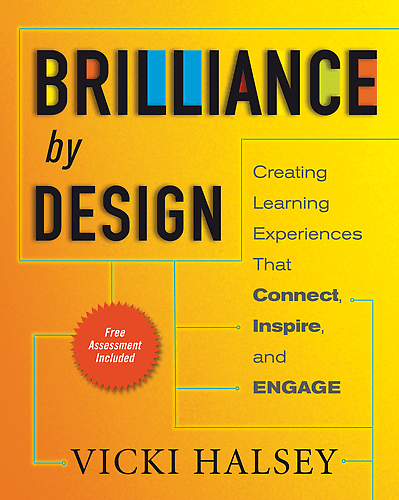 In her new book, Brilliance by Design, Vicki Halsey explains that if organizations want participants to be as knowledgeable and excited about the content as the teacher, they need to shift the focus from the teacher to the participants. In any good design 70 percent of the total learning event time needs to be the learners practicing new skills, working with them, and teaching others. Only 30 percent of the time should be devoted to the teacher teaching the skills to them. That means that instructors need to focus less on what they are going to say and instead devote a full 70 percent of their time and energy on creating activities that embed learning. To help presenters make the shift, Halsey suggests a six-step ENGAGE Model to replace the old “sit ’n’ get” model with “woo ’n’ do” so learners are actively drawn in and perform activities that reinforce the learning. Where is your training focused? Is it on the material and your role, or is it on giving students a majority of the time to practice and engage the new skills? Shift the focus for greater success and application. This sounds very similar to the principles taught by Bob Pike in his Creative Training Techniques workshops. Having personally experienced this type of learning environment I have to say I agree 100%. Active learning is where the learning takes place. That’s the way children learn from their parents on a daily basis. My 8 yr old daughter does all the asking, and I answer. Naturally, she learns. I’m looking forward to reading this book. That makes so much sense, especially “Extend learning to action by following up and helping learners create action plans.” Once you put the learning into action, you own it.